Sometimes you just want a knife capable of many things. Our Damascus Steel Utility Knife features steel that has been folded several times to create 250 layers giving the knife a unique ring pattern. This stylish blade is perfect for display as well as for use in a variety of tasks. This traditional knife blade is thick and strong and features a broad point and just enough curvature to accommodate about any task you may face. The rosewood handle offers a secure grip and features a brass lanyard hole. 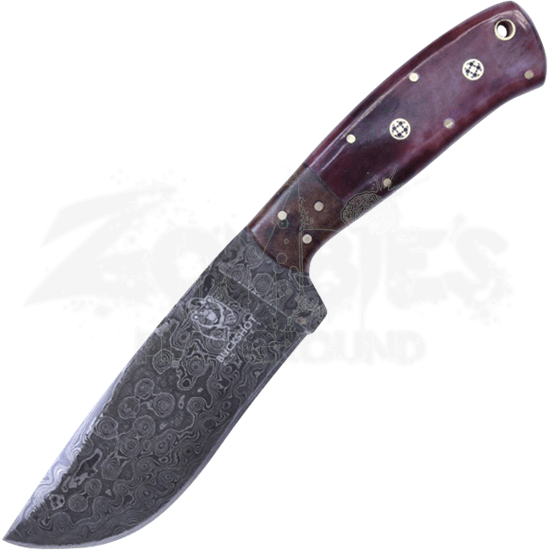 Included with this knife is a brown leather sheath making it easy to access and transport. If you are looking for a companion knife for hunting, fishing, cooking, or just plain owning, this Damascus blade is perfect for you. Never feel unprepared with this unique fixed blade knife at your side.